Announcing “BOO! 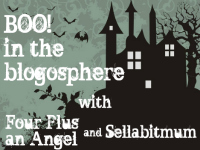 In the Blogosphere” – Link-up for Halloween Treats! So Halloween is almost here and since we all want to show off the costumes we bought on clearance last year slaved over, what better way to do it than have a Halloween parade in the blogosphere? The lovely Jessica of Four Plus an Angel and I will be hosting a link up for all of your trick or treating shots. All you have to do is grab the button in the sidebar and link up a post of you, your kids, or your pet in Halloween attire. And, of course, if you are dressing up and linking up we will be handing out treats. Posts linked up will be randomly chosen for a few fantastic prizes!!! Link up will be held October 29 – November 5. Grab the button from my sidebar and make sure you tweet with the hashtag #boo. Can’t wait to start the trick or treating fun! so fun – grabbed it!! Oh good – I hope you will join us! 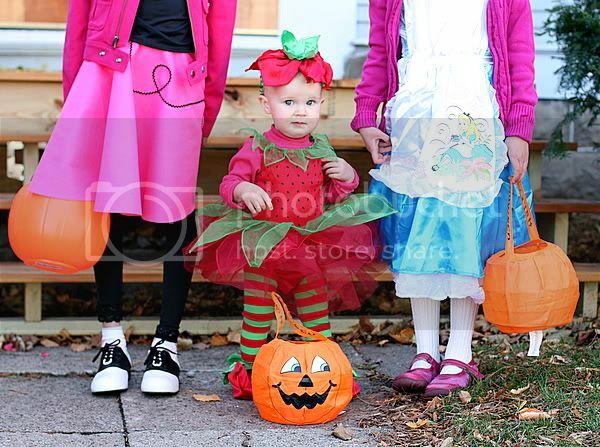 Okay, Astrid is the cutest strawberry ever! And such a cute linky. At our house, we’re trying to figure out how old is TOO old to Trick-or-Treat. My daughter’s 13 and still really wants to go. Opinions? Our neighbor girls tot’d until 8th grade – BUT she went with younger kids in more of a babysitter role but was also dressed up and didn’t take candy. Okay so how did you get the grab box to post??? And that picture is ADORABLE, they could have been our button. I did not think of that. The only way I can get the grab box to work is to make it the last thing I add to the post in HTML mode and then save and publish immediately. If I have to go in and then edit the post my grab box goes away. oooh can’t wait to get my kids in their adorable costumes and link up! YAY – so glad you will join! OMG, she is THE most ADORABLE strawberry I’ve ever seen! And strawberries. And pumpkins. Pretty much food, in general. So I’ll be linked up for sure. Hopefully dressed as something edible. Or was it supposed to be my kids? DANG it. I do hope you link up a pic of YOU in costume. Sushi maybe? What fun! I have no idea if we’ll be doing anything but if we are, I’ll link up. Fun! Lil’ Bit will be dressing up as Lambie this year in a costume that I neither bought on clearance nor made, but was well worth the $34 I paid for it because of how darn cute she looks in it. I considered dressing up as a slutty Little Bow Peep to go along with it, but… well… no. That little strawberry cap on Astrid’s head is literally the icing on the cake – precious! You would be an amazing Little Bo PEEP Show. Truly. That photo is amazing – beyond gorgeous! Is it too late for me to pay you to make my kid a costume? MAKE? OMG – go to Pottery Barn Kids or Chasing Fireflies stat. Can I pout a little and say that there are so many more cuter girls’ costumes than boys’? That’s just the cutest shot ever!!! What a fun idea! Hopefully I can catch both kids in costume…harder than it sounds! Oh how fun! This is my first Halloween as a mom so I’m super excited. Even though my daughter will have no clue what’s going on! Sounds like fun! That picture is so cute!!! This looks like SO much fun!! And I will most likely have my iPhone by then so I will be able to participate!! Guess we need to decide what we’re going to be for Halloween over here, huh? Very fun idea! Will definitely come participate. What an awesome picture! LOVE the strawberry! fun! I’ve grabbed the button and will come back and link up after Monday. Forget the hashtag and the link up. I will never, ever win at life. Either the real one or the virtual one.